Today while the kids were at school, I enjoyed the best of both worlds. After taking my dog, Brownie, for a walk and finishing my workout when I got home, I sat down at my art desk and worked on tracing my blue flowers. I set my timer so I wouldn’t sit there too long, though, because I had something else I wanted to complete. After having some lunch, I went to the computer, got my iPod out, put my earphones in, found a hard rock playlist and looked up my autobiography. Then I proceeded to change my Chapter Seven which actually became Chapters Seven through Ten. Whew! That was a lot of fun. I didn’t quite finish before I had to go pick up the kids from their classes. But I finished when I got back. Then I went to my other blog and posted all of them. Writing has become more enjoyable for me in the past few months, more than at any other time in my life. So now I feel like I’m competing with myself for the attention of myself. Does that make sense? Well, anyway, there are two people inside competing with each other for my attention. Wow, I guess I’ve become a trinity. My art is competing with my writing. Sometimes it makes for some tough choices on a daily basis. But I am trying my best to let them both win! Hopefully, one won’t begin to suffer when the other is getting more attention. They can be so fickle! But of course this all goes back to my “problem” of having so many different artistic interests. Did I mention I play piano and guitar also? I think I did somewhere, just not today. I did play my poor lonely piano the other night. It felt so great! But my guitar keeps calling my name. I really need to get her (yes, her) out and play her soon. Someday I’ll post a picture of her. She’s a beautiful black Takamine with white flowers. She sounds so beautiful, especially when someone else who can REALLY play picks her up. I only know a couple of songs and a few scales so far. But soon I want to get back into playing every day again. So…whatever your interests, make a little time for all of them, a little here, a little there. Art, music, and writing, etc. Oh yeah, that does remind me. The last couple of days I even got out my camera! 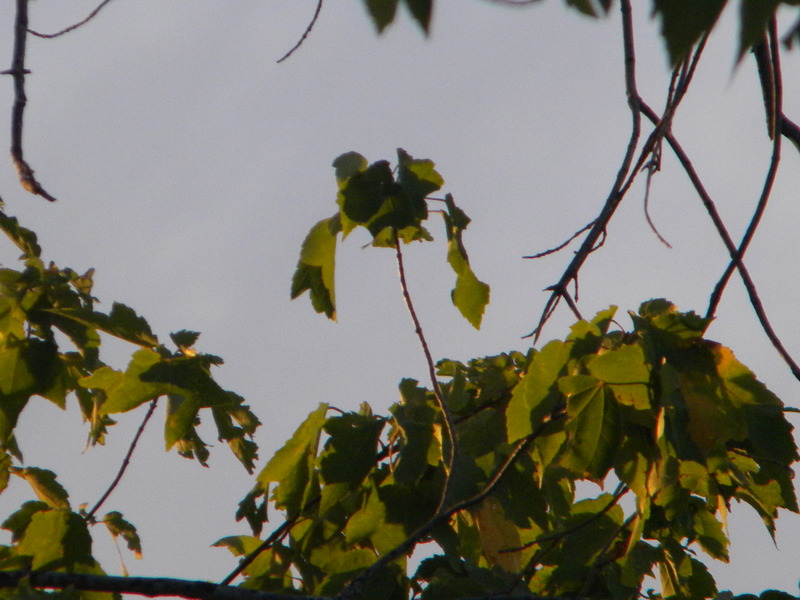 I love to take pictures of birds mostly, but I got a great picture of this tree leaf. What does it remind you of? The shape reminds me of something specific, but I’m not giving any hints. Sorry. Just think on it and get back to me! Have a great day! Posted on September 18, 2013, in My Thoughts. Bookmark the permalink. 2 Comments. Oh come on guys! No one’s going to venture a guess?? ?